What if your next marketing campaign could guarantee that it was shared by your customers to new relevant people, that you otherwise wouldn’t have been able to reach? Social Interactive Content is the latest addition on Dot.vu, which is a content type that engages your customers in branded experiences and prompts them to share it with their friends. People are far more likely to buy something when they are referred by a trusted friend – and that’s exactly why gearing your next marketing campaign to incentivise social sharing is bound to be a winning formula! With Social Interactive Content you are essentially merging interactive content with a social dimension, that requires customers to share the experience among their friends – much like referral marketing. The focus here is really on facilitating engaging and personal experiences around your brand, to create positive brand association. 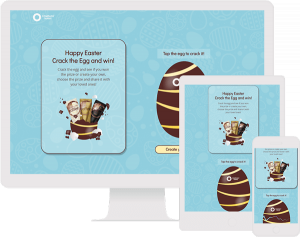 Social Interactive Content can be used in many different contexts, such as after a purchase, when signing up for a newsletter, as a seasonal campaign, for an event or something entirely else that make sense for your business. Social Marketing Games – Activate your customers with a fun game where friends can cooperate or challenge each other for a chance to win prizes. Personalized Gift Card Generators – Have your customers customize and share a gift card with a friend. Shareable Mystery Boxes – Give loyal customers the opportunity to create and share a mystery box that contain a secrete prize with their friends. Incentivise shares through rewards like loyalty points, discount codes or something else. Selfie Card – Have people take a selfie and enrich it with a fun scratch card, that their friends can scratch for a chance to win a prize. Personal Video Greeting – Let customers choose between different types of video messages and enrich the experience by adding their friend’s picture and name. As an example, let’s have a look at the process behind our “Gift Card with Wheel of Fortune” template. This is a mix between a personalizing a gift card for a friend and a game experience. 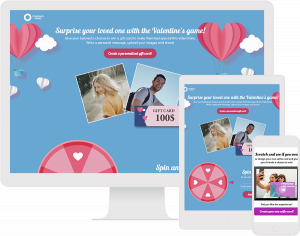 The experience requires someone to customize a gift card by uploading two images and adding a custom message – Ideal for Valentine’s or Christmas, where sharing a gift card matches the spirit of the seasonal event. The first person must first configure a gift card, which he/she can then share through Facebook or as a link. When the second person arrives, he/she must give their email to play the game and for their chance to win a prize – Tip: you can use instant-win to further incentivise participation. If a person should be lucky enough to win, they can claim the prize right away and choose to create a new gift card. Should the person lose, they can earn an extra spin by sharing the game on Facebook. A concept like this is perfect for leveraging the reach of your customers, by motivating them to share something fun and personal with their friend or beloved one. To make for an even stronger impact you can choose to have customers choose between specific products that they think their friends will like. This way the experience becomes even more personalized, which will ramp up engagement-rates and give you some valuable insights to potentially use in other marketing contexts. It’s important to realize that this is more than just some new hyped marketing trick – it goes deeper than that. It reflects the competitiveness of the digital space as well as a change in the way businesses and customers communicate and interact. With so many options to choose from, and so many marketers all shouting “choose me”, the options all start to appear and sound the same, making it tough for consumers to figure out whom can be trusted. When it comes to making a purchasing decision, customers will increasingly a) turn to the advice of their peers, and b) choose the businesses who have done the best job of earning their trust, based on their experiences interacting with the brand. With Social Interactive Content you can kill two birds with one stone, as the content both serve as a great experience while at the same time motivating customers to share it with their friends. This is beneficial as the communication then becomes peer-to-peer and not business-to-consumer, which is much more likely to grab attention and get people involved. Focusing on building relationships and earning loyalty through delivering exceptional experiences throughout the customer journey is key for marketers to effectively grow tribes of customers to advocate on their behalf and help organically grow their business – Social Interactive Content is perfect for this. Have your customers share your message and boost social reach. Increase sense of trust and effectiveness, by having your message be carried by customers. Customers sharing your message will send it to people that are highly relevant and more likely to become new customers. Facilitate personalized experiences, which can help to differentiate your business and get your message heard. The people arriving through a customer sharing an experience is essentially free traffic that doesn’t cost you anything. Improve customer-relations by rewarding loyal customers that promotes your brand. 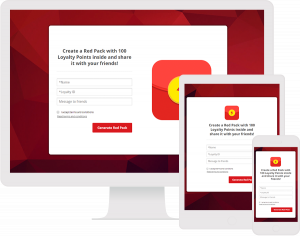 You can always create a free 15-day trial to see how easy it is for yourself. Alternatively, you can reach out to us if you have any questions, want to discuss how Social Interactive Content is best used for your business or if you want a demo of the platform!